Thank you to Campbell Soup Company for sponsoring this post! All opinions are mine. I’ve been working quite a bit lately. I don’t have the best time management skills so in-between my work, kid’s homework and activities and general housekeeping duties, I often find myself scrambling to make a family meal at dinner time. I’m a firm believer in family dinners, so I’m always on the lookout for meal ideas that save me time and effort. On my last trip to the grocery store, I picked one of the new Campbell’s Soups for Easy Cooking. These new cooking soups are similar to the Cream of Mushroom and Chicken soups we are all familiar with, but they come in a pourable box and already contain the perfect blend of seasonings, allowing me to create delicious homemade meals in thirty minutes or less. 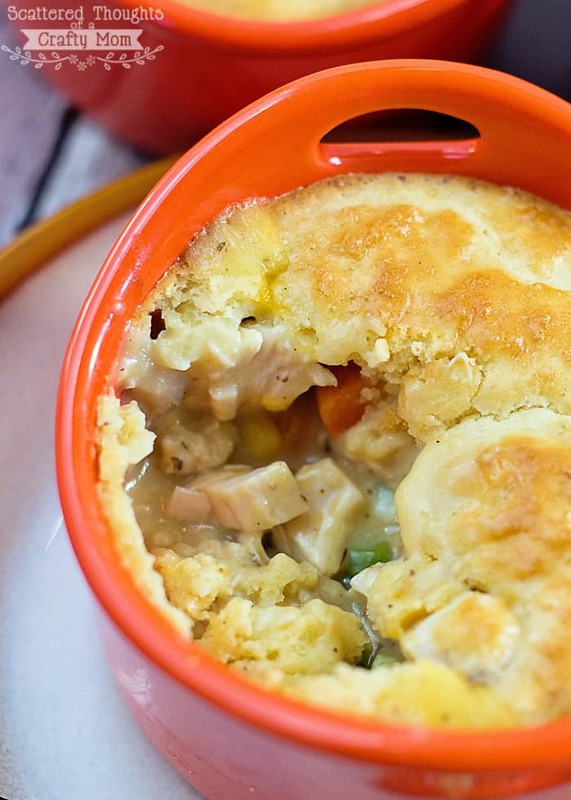 I decided to try out the Creamy Herb & Garlic with Chicken Stock, which is perfect for pot pies and casseroles. The cooking soups also com in Savory Portobello Mushroom, Sweet Onion, and Mexican Style Tomato. There are some really yummy and easy looking recipes over at Mealsin30.com, so be sure to take a moment and browse around. You might find a new family favorite. 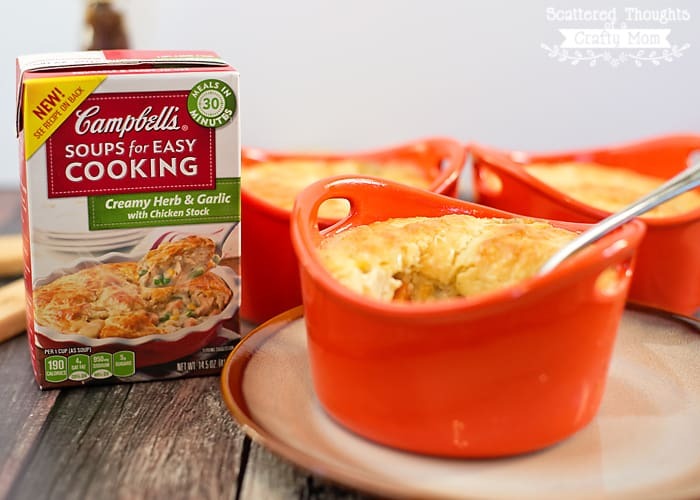 See the recipes here ==>> Campbell’s Soups For Easy Cooking Recipes. I have these cute little ramekins and haven’t used them yet, so I decided to make Mini Pot Pies. 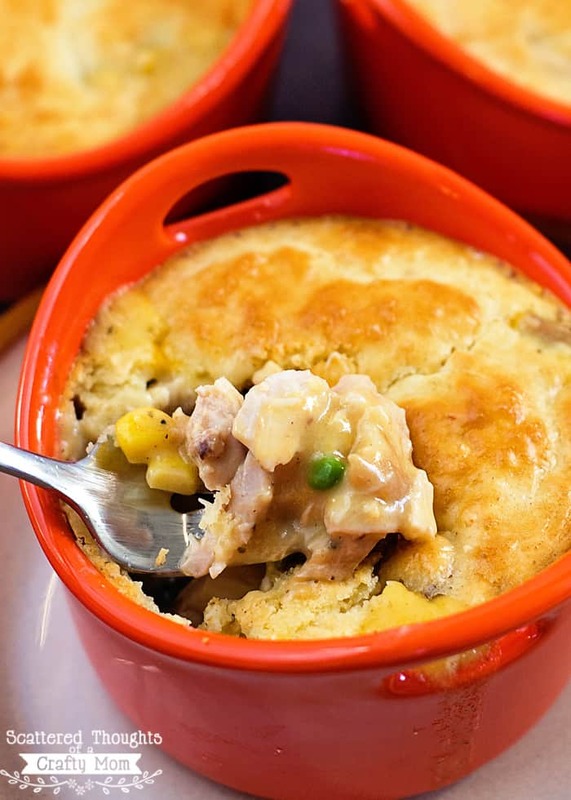 The prep and cook time is the same whether you make mini or a full sized pot pie. 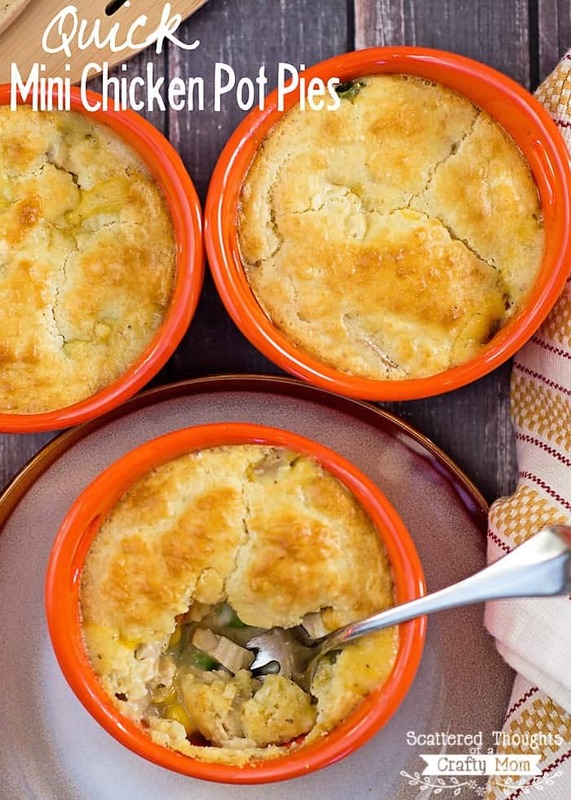 Are you skeptical about how quick and easy these little pot pies are to make? I’m serious when I say they took 5 minutes to prep and 25 minutes to bake. Check out the little video my hubby helped me make to show off how easy it really is! Recipe notes: After I shot the video, I decided the biscuit topping needed to be doubled. The ingredient list below includes the doubled amount. In a smaller bowl, stir the milk, eggs and baking mix in a small bowl. Grease 4 to 6 ramekins (depending on size- I did use to additional white ramekins.) Add chicken mixture to ramekins. Spread the biscuit batter over the chicken mixture. These look so good! I need to learn how to make videos for my posts! Thanks for sharing on Show Me Saturday! As for the zipper pouch, after you fold it together, sew the two end zippers together.